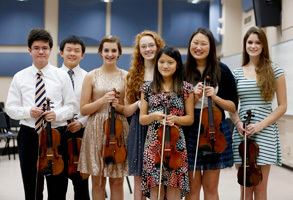 Each year, 150 children ages 4-18, from all cultural and socioeconomic backgrounds, study violin, viola, and cello performance at the String Academy of Wisconsin. With careful guidance from professional artist faculty, students engage in a challenging course of study that includes private and group instruction, weekly classes in music theory, and ear training. This comprehensive learning experience with its many performing opportunities offers much more than simply a music education. Students also learn self-discipline and poise, which will serve them well throughout their lives. The Academy strives to make an excellent music education affordable for all. Each year, we provide scholarships and instruments to at least 36 students as part of the Urban Students in Arts Scholarship Program. Participating families contribute a portion of what they can toward tuition. String Academy faculty provide instruction for students with demonstrated potential and a strong desire to learn in our program, including outreach sites at two MPS schools, Escuela Vieau and Milwaukee MacDowell Montessori. The arts are fundamental to our humanity and a crucial factor in academic and professional success for young people. Thank you, and we wish you a warm and happy holiday season.